I don’t have a lot to say about today’s recipe other than that it’s an adaptation of a Rick Bayless recipe from a book I checked out from the library and that I bought a jar of ancho chile powder just to make it. The original recipe included chicken, white rice, and 2 tablespoons of oil, but I managed to leave out all of those ingredients and come up with a recipe that is, I think, very faithful to the original. That’s mostly because it’s a very simply seasoned recipe; the aforementioned ancho chile powder is the predominant flavor in the dish. Fortunately, ancho is a mild chile, so this dish isn’t rip-your-tongue-out hot. If there’s a problem with the dish it’s that it is sort of a one-note performance–I missed the complexity that a little cumin or oregano might have offered. Fortunately, adding salsa at the table really pulled the dish together. Don’t omit the salsa! We made a simple meal of this with a nice, big salad. The four servings that it makes are fairly large, but for more people or bigger appetites, add another vegetable or side dish. To replace the chicken in the original recipe, I used the kind of dried bean curd found in Asian markets, but you can use soy curls, smoked tofu, TVP, or additional beans instead. 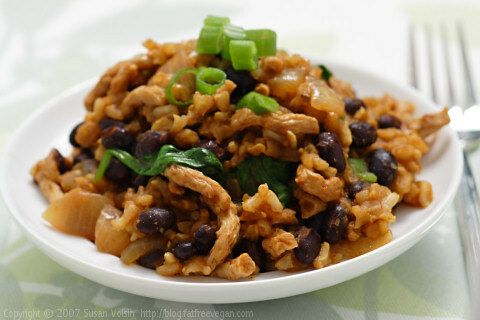 Rehydrate soy curls or TVP chunks the same way as dried tofu; skip the soaking for smoked tofu or beans and add them to the rice along with the black beans. Add additional chile powder to taste. Heat a heavy saucepan on medium-high and add the onion. Cook, stirring, until the onion becomes translucent. Add the rice, garlic, 1 1/2 teaspoons of chile powder, and smoked paprika and cook for 1 more minute. Add the broth and salt (use less if the broth is salted) and stir well. Bring to a boil, reduce the heat to low, and cover the pot. Cook for 25 minutes. While the rice is cooking, prepare the dried tofu, soy curls, or TVP if you’re using it. Place the dried tofu/soy curls in a microwaveable bowl and add the 1 cup vegetable broth. Add enough water to cover, and stir in 1 teaspoon of chile powder. Microwave on high power until broth boils. Stir and allow to stand until dried tofu is tender. (If you’re using large chunks of TVP, additional cooking time may be necessary.) Alternately, bring to a boil on the stove for 1 minute and let stand until tender. After the rice has cooked for 25 minutes, drain the dried tofu and add it and the black beans to the rice. Do not stir–just put them on top of the rice. Re-cover the pot and continue to cook until rice is tender and liquid is mostly absorbed, about 25 minutes. Add the green onions and spinach, re-cover, and cook for 5 more minutes. Stir well to combine and serve with salsa at the table. Makes 4 servings. Each (excluding salsa) contains 379 Calories (kcal); 2g Total Fat; (4% calories from fat); 24g Protein; 69g Carbohydrate; 0mg Cholesterol; 729mg Sodium; 15g Fiber. Previous Post: « Come On, Get Cooking! What a comforting looking meal to make.